There’s a difference between throwing back a cup of coffee in the morning to get you going and being a true coffee lover. If you love to drink, smell and even make coffee than you probably are pretty particular about the type of coffee maker you use. Some coffee makers offer different methods of brewing and really get you involved in every step including roasting and grinding the beans yourself. Other still give you the convenience of one cup at a time from a neat prepackaged single serving. 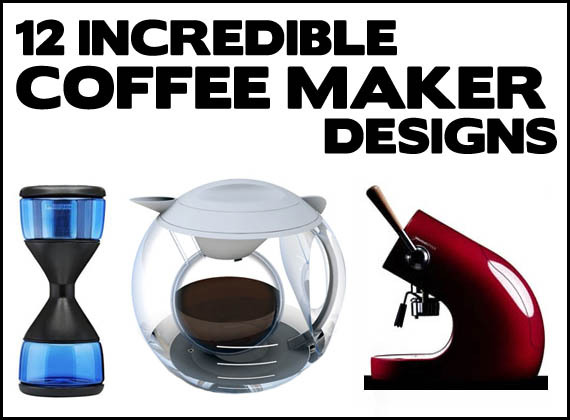 Whatever your coffee preferences may be you’ve got to check out these 12 incredible coffee maker designs. 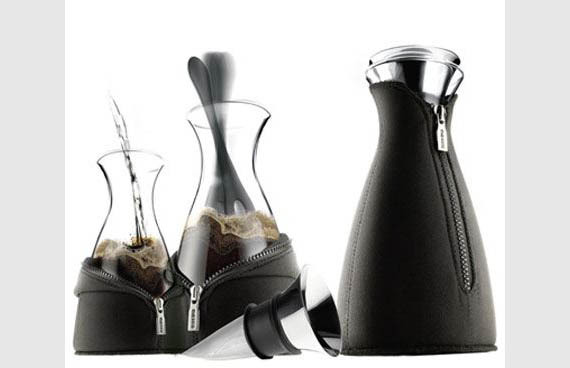 Designer Jan König went a long way to ensure that your coffee will be heated perfectly even and stay warm longer. 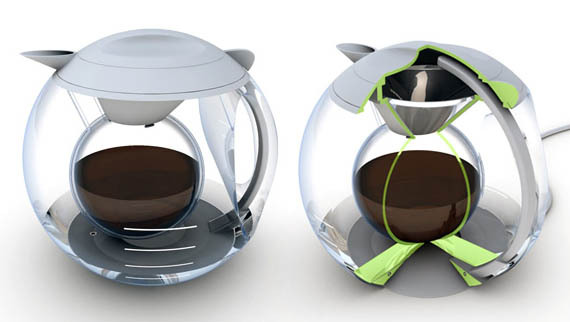 The dual sphere design not only looks really cool but serves to distribute heat perfectly as your coffee brews. When it’s done the outer bowl acts as an insulator for delicious coffee center. We have to imagine that the Cocoon Coffee maker is the only coffee maker ever designed that would be genuinely interesting to watch. You’ll think you’ve just seen some form of sorcery when you see how the Kahva Coffee Maker works. You fill it with water, bring it to a boil and then the water seems to magically flow upward where it mixes with the coffee grounds in the top. Turn off the heat and watch the brewed coffee pour back into the bottom. The Kahva Coffee Maker may have just trumped the Cocoon Coffee Maker as the most interesting coffee maker to watch. 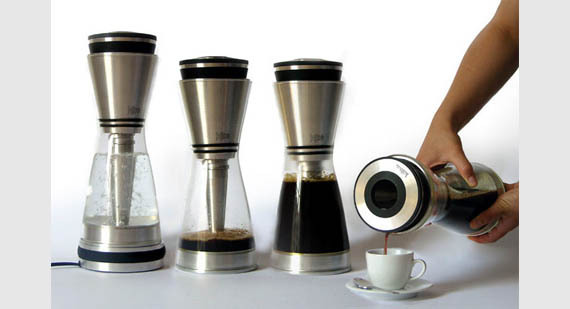 The IMO Coffee Maker has got to be the most compact coffee maker ever designed. If not for the little coffee cup icon on it we never would have guessed what this thing was. It looks more like a robotic arm you’d except to see in a space station than a coffee maker you’d expect to see in the kitchen. This coffee maker looks more like a chemistry set than a coffee maker. The Roaster Grinder Brewer gives you a much more intimate position in the entire coffee making process. You start with 50 raw coffee beans and roast them yourself to a roast you enjoy. Then you cool the beans, grind them and heat the water to a boil. Add the beans, brew for 4 minutes and enjoy! The whole process takes less than 30 minutes and lets you acheive the absolute perfect pot of coffee just the way you like it. The only way you could be more involved in the process is if you started growing coffee beans. 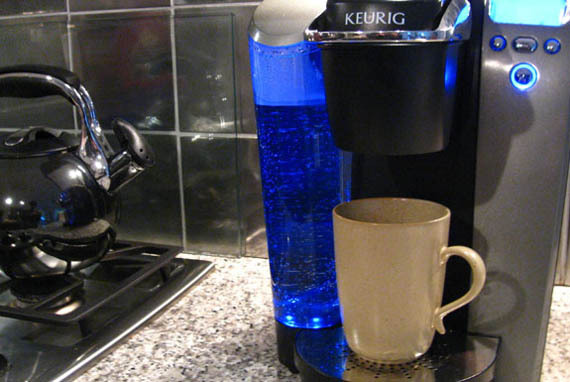 If you could go for a cup of coffee any time day or night then you should consider the convenience of a built-in coffee maker. Don’t worry about filling a reservoir and cleaning out a pot every day. 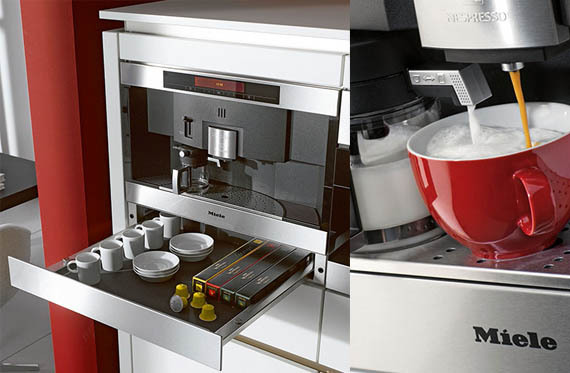 The Miele Built-in Coffee Maker is probably our favorite with a storage drawer that can hold your grounds and mugs so you don’t ever have to go far for a fresh cup of coffee. It also has a cappuccinatore jug for frothing milk that pours right into your cup. The WMF1 Single Serve Coffee Maker couldn’t be any more simple in terms of design or functionality. It features a mug shaped hole outlined in a bright color of your choice and comes with a mug that fits perfectly right inside. 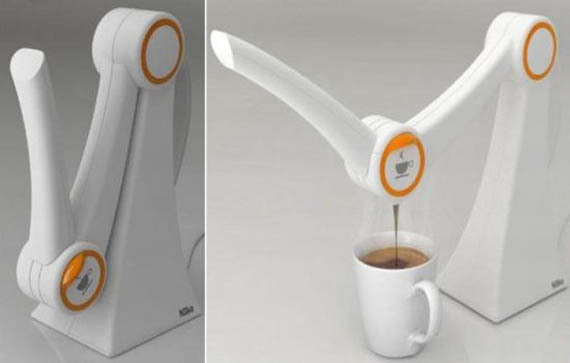 Above that it has a single button that you press whenever you want a fresh cup of coffee. Once you press the button you’re only 30 seconds away from enjoying a cup. 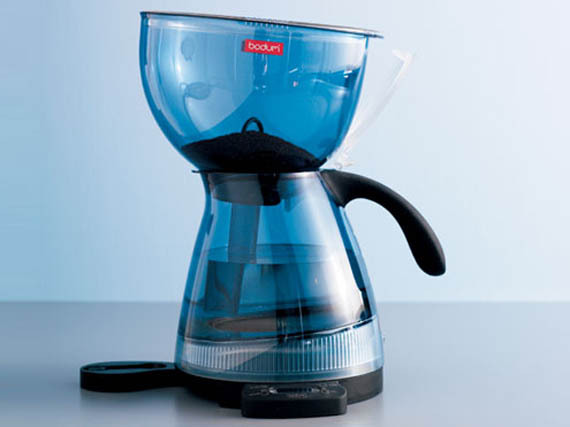 Calling the CafeSolo a coffee maker is a bit of a stretch since it’s basically just a Danish carafe dressed in a snazzy jacket to keep it warm, but it’s really about the brewing process. No filters, no steam, just boiling water poured into freshly ground coffee beans. 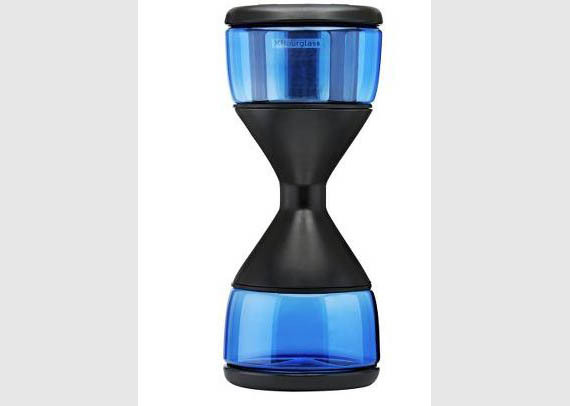 The filter funnel makes sure that there are no coarse particles of grounds as you enjoy your super fresh coffee. There are several machines missing from this list, along with many more entries with erroneous information. Built around the shell of a La Marzocco GS3 it is one of the most desirable single group coffee makers around. There are many more iconic machines such as the Atomic, one of the first viable home espresso makers, or the La Pavoni line of piston/lever espresso machines, where the pressure is supplied by the user. As for the errors, the statement the Nespresso pods are fresh is anything but true. By nature coffee is a fresh product which degrades over time. The rull of thumb is that fresh roasted coffee beans last 3 weeks and ground coffee lasts 3 minutes. The Nespresso, by design, seals ground coffee in foil to give the appearance of freshness. But there is still some oxygen inside, meaning the ground coffee can react to it and go stale. This is not even taking into account the time between the mass grinding of the beans and the packaging on the production line. The IMO (which is only in the concept phase) hardly compares to the mypressi TWIST ( http://www.mypressi.com )for compact design. As for the Roaster Grinder Brewer, while a novel concept, if the coffee is used immediately after roasting, rather than waiting the usual one week, the resulting beverage will be underwhelming at best, and bitter or acidic at worse. Lastly there’s the Miele. 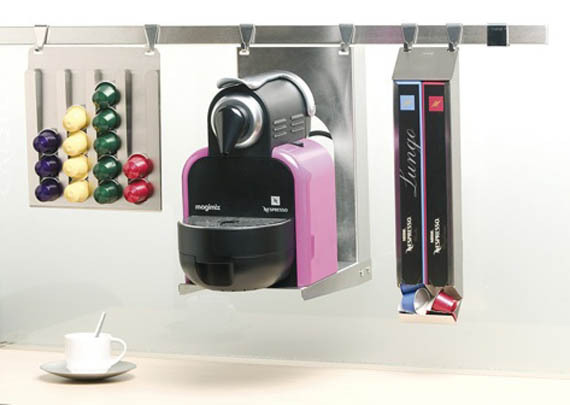 No automatic espresso machine will make coffee as well as a manual machine. They cannot grind the coffee fine enough without clogging, so the result is underextracted espresso. Add to this the fact that the beans are being heated all the time, causing them to lose their flavour as the oils seep out and the resulting coffee is bland at best. The only “incredible” thing about this list is that you didn’t include the La Pavoni Europiccola. At least then you could show people a machine that looks amazing and actually makes good coffee. Thanks for the write up. Some cool machines! You had me until you listed the Keurig. Then your coffee credibility went out the window. I agree with Bobbo, Keurig definitely has no value to that list. Chemex is a nice replacement. Luxurious and simple. This is so sad. And why *any* “capsule” type is included is preposterous. I have to suffer at work because they bought us a B60. So much so that the first thing I do when I get home is to fire up my Sona Ware tea kettle & brew a cup with a vintage Silex 2-cupper.